You may choose new targets for target spell. Might I recommend Insidious Will ? 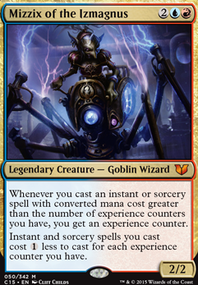 Yes, it’s more expensive, but in Jeskai Control combined with mana leak, it allows for some cool interactions. thom-le on Who am I? 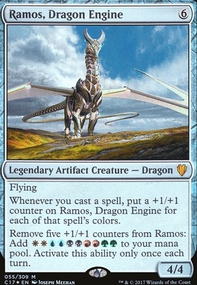 Ixidor, Reality Sculptor is actually my favourite character of the whole magic universe so your deck puts a smile on my face. Thank you for that. I like to suggest you some changes and I try to view those on a budget version. First things first: You need to have a strategy, that can win you the game. Morph is a great mechanic, but you have to take a look at how you want to play. Not every creature you play has to have Morph. Too much creatures, even for a commander like Ixidor. 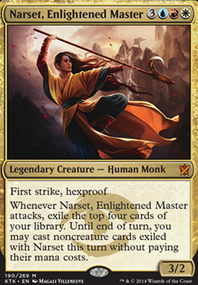 Skip Aquamorph Entity , Scornful Egotist , Riptide Pilferer , Monastery Flock , Dragon's Eye Savants , Coral Trickster . Those cards won't help you that much. Get a better card draw, you have to play a land every turn. Rhystic Study is a bit expensive, but does so much work. Standstill gives you time and almost card draw. Propaganda : For not getting attacked all the time. Wonder : Because in some time, you have to hit your opponents. You may also go deeper into the Wizards tribal. Y>ou already have many Wizards in your deck and Ixidor also is one. You won't be able to play big fattie creatures, but there are so many other ways to win the game, especially in blue. For the Wizards I'm thinking of Nameless One , Azami, Lady of Scrolls , Riptide Director , Information Dealer , maybe Patron Wizard . 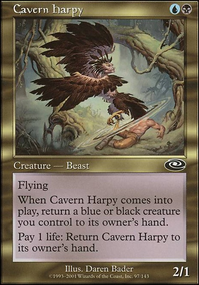 Guess this could be really strong, because with Wizards you gain in addition to the Morph ability a better card draw engine, better control abilities and many tribal connections. Insidious Will , Devastation Tide , and Worst Fears do interest me though. Yes, that's a good one... I won't be using the third ability of Insidious Will on any of my own spells, so I guess I'll do that. Thanks a lot! I_L_foxes Well I'm not sure which card would be the best to cut, since I'm not sure what works and what doesn't. Insidious Will seems expensive for what it does and isn't an enchantment, so maybe that? There's consequence to using Helm of Awakening because there's nothing worse than seeing your opponents use it for their advantage. Cloud Key is 1 more mana, but allows you to make a quarter of your deck easier to cast and doesn't help you opponents. 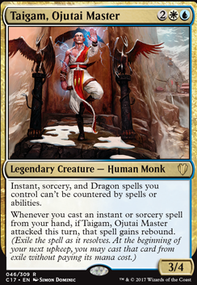 But your commander does a pretty good job of discounting 40% of the deck. I dislike Clone Legion , it doesn't look as though it does much to help you other than giving you an experience counter. Blasphemous Act will help get you experience counters while staying pretty cheap to actually cast, plus probably doing more than Clone Legion ever will. I would take out Bone to Ash and Desperate Ritual . The first one is just too limited since it can only counter creatures and since you have so many burn spells you don't really need to counter those to begin with. If you still want to put a counter spell I would place Unwind in that slot. As for Desperate Ritual , you don't play any other Arcane spell and alone it doesn't really do much in my opinion, I would swap it out with Primal Amulet Flip or one of the cards I suggested. 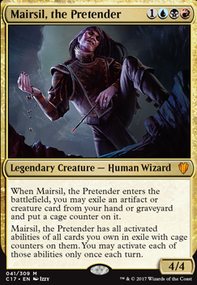 Lastly I would swap any of the counterspells you play with Insidious Will because of it's versatility. Here's some things you might consider changing around. This deck wants to win by copying lots of things. There are a few ways for you to win. One of the easier ways to do this might be to exploit Biovisionary . You just have to get four of him on your board by the end of your turn to win. 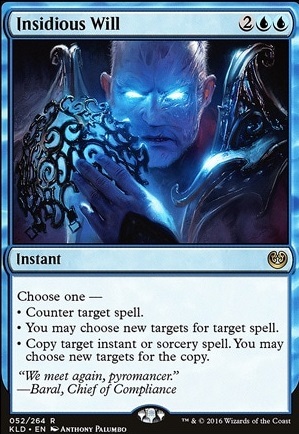 Cards that you included already, like Rite of Replication make this very easy to pull off, provided you have both ready to go. Ixidron , and Kederekt Leviathan can help to slow down your opponents and clear their creatures if you find yourself in trouble. Genesis is another good creature that can pull things from your graveyard if you screw up or someone kills your Biovisionary . Lastly, Crystal Shard , and Conjurer's Closet can be used to flicker your own creatures to have them constantly re-enter the battlefield and trigger effects. Insidious Will You have a lot of counterspells. Consider cutting some of the higher mana cost ones like this. Lightning Strike Bad. 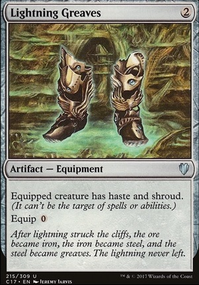 Lightning Bolt is better, but you really have no use for cards like this in the deck.